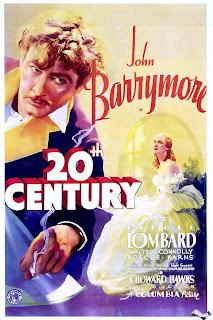 It's John Barrymore's birthday today so my Tuesday Favorite Film post, naturally, is about one of my all time favorite films. TWENTIETH CENTURY. 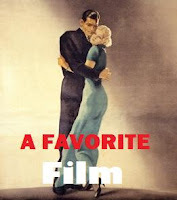 A manic screwball comedy directed by Howard Hawks. A film that made me fall off the sofa laughing. No harm done, except to my dignity. John Barrymore was one of those legendary actors who, far as I'm concerned, was best in roles that mocked his legendary status. He was superb in comedy. That devilish twinkle in his eye was picked up by the camera and you knew that he knew that you knew. Know what I mean? He really was the most awful scoundrel. It did him in, in the end, just as it did Erroll Flynn and several other charming, reckless, carousing types. Not easy people to be around, in reality (unless you were of similar type), not easy people to like or marry or live with, I imagine. But, on film, they occasionally made magic. 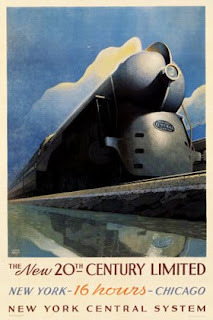 Anyway, in TWENTIETH CENTURY (the film is named after the cross-country train on which a great deal of the action takes place. 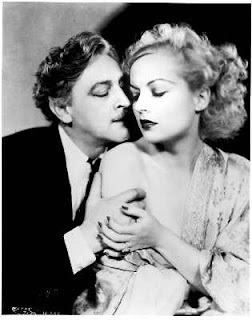 ), Barrymore plays Oscar Jaffee a has-been Broadway producer/director/actor who spends most of the film trying to get his one-time protege - now Hollywood star - Lily Garland (played by Carole Lombard), to star in his new come-back show. That's basically it. It's in the way Barrymore and Lombard go about this, not to mention the stellar supporting cast of wonderful character actors headed by the inimitable Roscoe Karns. Everyone in this film has their own madcap agenda, their own reason for pushing the two stars together or attempting to keep them apart. Oh, and did I mention that most everyone in the film is nutso? Well, yeah. It's a fact. Movie-nutso, as opposed to reality-nutso. So it's okay to laugh. Barrymore and Lombard play theatrical types, heavy on the temperament and overblown gesture. They live to make Drama out of every day life - turmoil is their middle name. Neither of them is very likable. You don't really care what happens to them in the end. It's one of those comedies that sort of spins on its own, perpetual frenzied motion. AND YET - yeah, you want to see what preposterous thing happens next. You can't help it. It's all so absurd. The film has its own lunatic lure. In a way, you can't help feeling a bit dejected that you don't know anyone like this in real life. These people may all be crazy but boy, do they have fun and she makes the most of it. Barrymore plays another caricature of himself (something I think he got used to doing over the years) but does it so manically and so theatrically that you get caught up in it despite knowing that he really is just a perfect ham-bone. Lombard is no better, first as a young actress who catches Barrymore's eye and is given a small role in one his early Broadway smash hits. She then allows herself to be seduced into stardom, literally and figuratively. 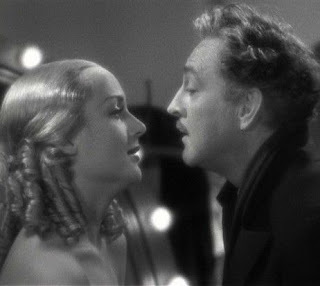 There is one scene near the beginning of the film when Lombard is crying on Barrymore's shoulder over some nonsense or other and you can see Barrymore skillfully guiding her backwards towards his dressing room while seeming to console her. Finally he gets her in the room, her back to us, his face leering out at the camera as he grins and closes the dressing room door on us. SO FUNNY! What a dreadful man! But really, Lombard is his flamboyant equal. She plays Lily Garland as a temperamental, borderline hysteric using Barrymore to get ahead just as much as he's using her. Eventually she leaves his clutches and becomes a famous Hollywood star while Barrymore's career goes down the tubes after a series of bad productions. When after some years, he gets his hands on a preposterous script for a Biblical (?!) play he wants to produce with Lombard as star, he makes plans to get her to sign on the dotted line for old time's sake, never mind that they parted on the most acrimonious of terms. (He can't get backing for the show unless Lily Garland stars in it.) On the eve of her planned marriage to some ridiculous Hollywood type (if I'm remembering correctly), they are all travelling together on the Twentieth Century either headed east or headed west - doesn't much matter. 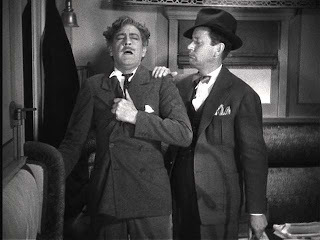 Lombard's fiancee is the sort of perpetual weak-chinned, sniveling sort that these types always were in these films and among Barrymore's travelling companions is the one and only Roscoe Karns who play his wise-cracking agent as only Roscoe can. They're also accompanied by a bunch of loonies straight from central-casting who traipse in and out of scenes either stealing them or being overwhelmed by Barrymore and Lombard's duelling personalities. Among the train passengers is one harmless looking little guy who spends the trip passing out religous pamphlets and stickers. I can say no more or I'll ruin the fun. The funniest scene, from my view is one that involves a perceived attempt on Barrymore's life. I can say no more. I laughed until I cried and fell off the sofa. Comedy can be dangerous. An aside: another of the traveling cast of outrageous characters is Charles Lane who went on to play these sorts of guys over and over and over again, later in television. The guy practically lived forever - he only passed away, finally, a couple of years ago. What can I say, he was the most wonderful, cantankerous type. There's no one like him in films today. TWENTIETH CENTURY is a gem from devilish beginning to inspired end. If you haven't seen it, you really must. But only if you enjoy laughing AND you have a weakness for Broadway/Hollywood types of the 30's and 40's AND a softspot for Barrymore and Lombard. Is it bad that I'm not a hug Lombard fan? I can barely tolerate her for some reason, My Man Godfrey is about the only movie I can sit all the way through without getting grouchy. I have a lot of friends who love her but for some reason I don't. 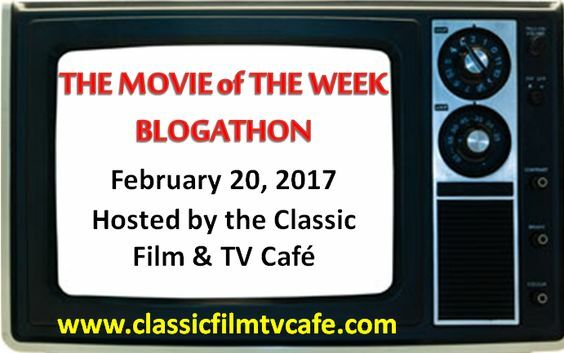 If this is one of your favorites I may give it a try sometime if it's ever on TCM. Who knows I may end up loving it. Sounds great! I do like Carole Lombard. Will put this on my TBW (To Be Watched) list for the library. 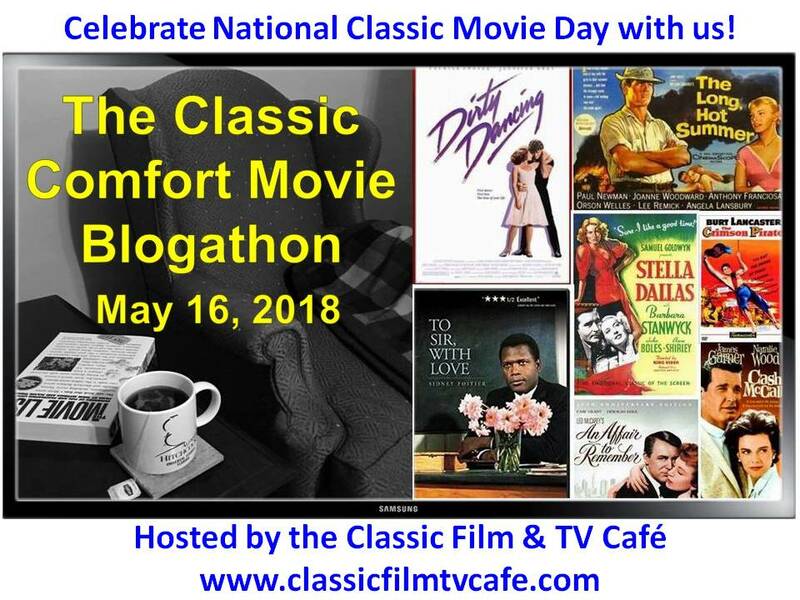 Is this a coincidence or does it seem like everyone in cyberspace and among my friends and relatives is watching classic/vintage movies and old noir? Ryan: You're allowed to like whom you like - or not - as the case may be. But c'mon, Lombard??? Oh well, nobody's perfect. Ha! You might appreciate her in this. She is SO preposterrous and MEANT, really NOT to be very likable. She and Barrymore are both of a type in this. The whole thing is just so damn funny. VP: I loved Charles Lane in anything he did. Everytime I saw him in a film, I would feel like I was coming across an old friend. 2007 - he practically DID live forever - didn't he? Unbelievable when you think what he did, who he worked with and what he must have seen in his long life. Wonderful actor. Great career.I remember him too, from I Love Lucy in which he often popped in and out. You will love this film! 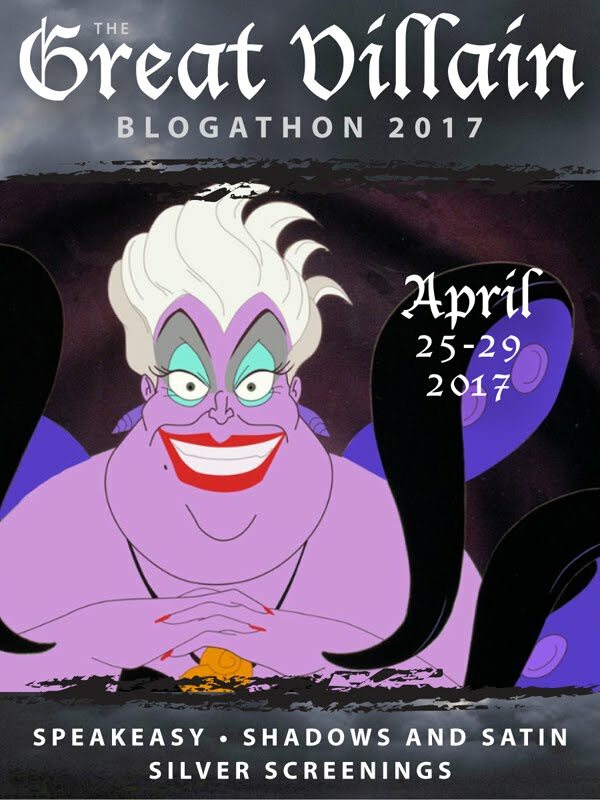 Prepare to LAUGH! I haven't seen it, but I want to now! I haven't seen any Barrymore movies (John, at least... have seen plenty of Drew). Great review! A great film. How can it not be with Charles Lane in it? Oh, yeah, and those other two. What are their names? Ha! Not to mention the one and only Roscoe. Remember Rocky King, Private Eye? Probably not, you're not old enough. But I do. Used to watch it all the time.